The sum of the proper divisors of a number determines if the number is abundant, deficient, or perfect. If the sum is greater than the number, the number is abundant. If the sum is less than the number, the number is deficient. If the sum is equal to the number, the number is perfect. The first 25 abundant numbers are 12, 18, 20, 24, 30, 36, 40, 42, 48, 54, 56, 60, 66, 70, 72, 78, 80, 84, 88, 90, 96, 100, 102, 104, and 108. Notice that all those numbers are even. OEIS informs us that 945 is the 232nd abundant number. The first 231 abundant numbers are all even numbers. Wow, 945 is the smallest ODD abundant number. OEIS also lists the first 31 odd abundant numbers. Every one of the first 31 is divisible by 3 and ends with a 5, but if you scroll down the page you’ll see some that aren’t divisible by 3 or aren’t divisible by 5. 1 × 3 × 5 × 7 × 9 × 11 = 10,395 made the list. 945 is a composite number. The exponents in the prime factorization are 3, 1, and 1. Adding one to each and multiplying we get (3 + 1)(1 + 1)(1 + 1) = 4 × 2 × 2 = 16. Therefore 945 has exactly 16 factors. The red leaves on the tree are prime numbers. Gathering the six red leaves from either factor tree above gives us 840’s prime factorization: 840 = 2³ × 3 × 5 × 7. Now 840 is not the smallest number to have six red leaves. In fact, there are smaller numbers with as many as nine leaves, but 840’s six innocent-looking red leaves will turn into a whopping 32 factors! 840 is a composite number. Prime factorization: 840 = 2 × 2 × 2 × 3 × 5 × 7, which can be written 840 = 2³ × 3 × 5 × 7. The exponents in the prime factorization are 3, 1, 1, and 1. Adding one to each and multiplying we get (3 + 1)(1 + 1)(1 + 1) )(1 + 1) = 4 × 2 × 2 × 2 = 32. Therefore 840 has exactly 32 factors. Taking the factor pair with the largest square number factor, we get √840 = (√4)(√210) = 2√210 ≈ 28.98275. 840 is also the smallest number that can be evenly divided by the first eight counting numbers! 840 is more than the 40th triangular number (820) and less than the 41st triangular number (861). We can also arrive at the number 40 by using √(1 + 840×2) – 1 = 40, no rounding necessary. 840 has six odd factors that are not more than 40, namely 1, 3, 5, 7, 15, 21 and 35.
using 35 numbers with 24 as the middle number. Notice each of those ways has a factor pair of 840 in the description. The largest power of 2 that is a factor of 840 is 8, which doubled becomes 16. Which of 840’s odd factors multiplied by 16 are not more than 40? 1 × 16 = 16, and 3 × 16 = 48. Oops, that’s too much. The rest of its odd factors times 16 will be too much as well. Nevertheless, we can write 840 as the sum of 16 counting numbers. 840÷16 = 52.5 so 52 and 53 will be the 8th and 9th numbers in the sum. Only even numbers can be the sum of consecutive even numbers. How do we find consecutive EVEN numbers that add up to an even number? Let’s use 840 as an example again. 840÷2 = 420. √(1 + 420×2) – 1 = 28, no rounding necessary, so we will make a list of the odd factors that are not more than 28. They are 1, 3, 5, 7, 15, and 21. We also note that the largest power of 2 that is a factor of 420 is 4. Doubling 4, we get 8. Which of 420’s odd factors multiplied by 8 are not more than 28? 1 × 8 = 8, and 3 × 8 = 24. All of the rest will be too much. We can also write 840 as the sum of an even amount of consecutive even numbers. using 8 even numbers: 2 times (49 + 50 + 51 + 52 + 53 + 54 + 55 + 56 = 420) becomes 98 + 100 + 102 + 104 + 106 + 108 + 110 + 112 = 840. Notice that 840÷8 = 105, the odd number that is between the two numbers in the exact middle of the sum. Likewise, using 24 even numbers: 12 + 14 + 16 + 18 + 20 + 22 + 24 + 26 + 28 + 30 + 32 + 34 + 36 + 38 + 40 + 42 + 44 + 46 + 48 + 50 + 52 + 54 + 56 + 58 = 840. Notice that 840÷ 24 = 35, the odd number that is between the two numbers in the exact middle of the sum. Let me first point out that every square number, n², is the sum of the first n numbers. Yes, every square number, n², is the sum of the first n odd numbers. To write a non-square even number as the sum of consecutive odd numbers, the first thing we must do is determine if the number can be written as the difference of two squares. If an even number has a factor pair, b × a, in which b > a, and BOTH a and b are even, then that even number can be expressed as the difference of two squares by using [(b + a)/2]² – [(b – a)/2]². Now as long as an even number can be expressed as the difference of two squares, B² – A², then that number can be written as the sum of all the odd numbers from 2A+1 to 2B-1. Thus, 840 with its record setting 32 factors, can be written as the sum of 7 consecutive numbers, 7 consecutive even numbers, and 8 consecutive odd numbers! Incidentally, being able to write 840 as the difference of two squares, eight different ways also makes 840 a leg in at least eight different Pythagorean triples. Those Pythagorean triples can be calculated using the numbers from the difference of two squares. For example, 682-840-1082 can be calculated from 2(31)(11), 31² – 11², 31² + 11². 840 was the leg for those eight triples. It is possible that looking at 2(b)(a), where b × a = 420, will produce some more Pythagorean triples with 840 as the leg. 840 is also the hypotenuse of one Pythagorean triple, 504-672-840. 840 is also the sum of twin prime numbers 419 and 421. 680 What Would Happen If Ten-Frames Looked Like This? Numbers ending in 0, 2, 4, 6, or 8 are even. Numbers ending in 1, 3, 5, 7 or 9 are odd. Those two simple concepts are not always easy for young children to understand. 0, 2, 4, 6, 8; being EVEN is just great. 1, 3, 5, 7, 9; being ODD is just fine. Still students in early grades struggle with the concepts of odd and even. Another seemingly simple concept is what pairs of numbers add up to ten. That concept also isn’t as easy for children to understand as adults might think. Free ten-frame flash cards are available on her site to help students learn addition and subtraction facts. What a powerful way for students to learn! She also has Halloween/Thanksgiving ten-frames for sale at Teachers Pay Teachers. Children would still learn how to add and subtract, but would they also instinctively learn the difference between odd and even numbers? Would they figure out for themselves that adding two even numbers or adding two odd numbers ALWAYS makes an even number? Or that adding an odd number and an even number together ALWAYS makes an odd number? Or would changing the ten-frames not make any difference at all? Will the mitten ten-frames only make a difference if the parent/teacher/tutor talks about the odd and even numbers? I don’t know the answer to those questions, but I think the idea is worth trying. I’ve made Mitten Ten-Frames for all the numbers from 0 to 10. The “empty” frames have outlines of mittens to help children know if a left or a right mitten belongs there. The mitten ten-frames don’t have a second border to guide in cutting them out, so the flashcards might not look as good as Donna Boucher’s, but they should still work as flashcards. Follow Donna Boucher’s instructions exactly. If you use the mitten ten-frames, please add a comment to let me know whether or not they make any difference helping students learn the properties of odd and even numbers. 1² + 3² + 5² + 7² + 9² + 11² + 13² + 15² = 680. Because 5, 17, and 85 are some of its factors, 680 is the hypotenuse of four Pythagorean triples. Can you find the greatest common factor of each triple? 680 is a composite number. The exponents in the prime factorization are 1, 3, and 1. Adding one to each and multiplying we get (3 + 1)(1 + 1)(1 + 1) = 4 x 2 x 2 = 16. Therefore 680 has exactly 16 factors. Taking the factor pair with the largest square number factor, we get √680 = (√4)(√170) = 2√170 ≈ 26.0768096. 275 is a composite number. The exponents in the prime factorization are 2 and 1. Adding one to each and multiplying we get (2 + 1)(1 + 1) = 3 x 2 = 6. Therefore 275 has 6 factors. Are six-year-olds too young to learn about odd and even numbers? I recently read a post at mathfour.com that discussed the “basic” concept of odd and even numbers and children’s ability to understand the difference. The article made me very curious so I talked briefly to 45 first grade students about even and odd numbers. What did I find out? Almost all of them had been introduced to the concept in kindergarten and knew that 1, 3, 5, 7, 9 are odd numbers while 2, 4, 6, 8, 10 are even. But most of these first graders did not understand that fact because about a third of the students thought that 32 is odd! One little girl explained to me how odd and even numbers alternate. She said, “If 99 is even, then 100 will be odd.” She remembered that concept but didn’t understand it well enough to apply it to the example she gave! Even though odd and even numbers may be a difficult concept to learn, teach the concept and use it anyway. In fact, talk about it to preschoolers while you put on their socks, shoes, or mittens. One,_Two,_Buckle_My_Shoe. Children learn to recite numbers in order before they learn how to count, and that helps them learn how to count and later how to add or subtract 1 from a number. I have tutored bewildered looking students who weren’t sure what to do with 8 + 1 = until I told them that 8 + 1 = means “what number comes right after 8 when you count?” Likewise, 8 – 1 = means “what number comes right before 8 when you count?” After hearing those questions, these students immediately knew the answer, and they didn’t count to find it. Children who can quickly recite the odd numbers to 11 and the even numbers to 10 will have an easier time adding or subtracting two from a number. When they see 3 + 2 =, they can remember that 3 is odd and then ask themselves what odd number comes after 3. Likewise when they see 8 – 2, they can remember that 8 is even and recall that 6 is the even number right before 8. The way I remember it, I was in second grade when I first was told that an even number plus an even number is even, an odd number plus an odd number is even, while an even number plus an odd number is odd. Any student learning to add or subtract would benefit from that tip. Adding 4 to an odd number gives the second odd number after it while adding 4 to an even number gives the second even number after it. Subtracting 4 has a similar rule. Adding 3 or 4 will mean additionally memorizing that 12 and 14 are even and 13 is odd, but that will be all a first grader needs to know about odd and even numbers. Later these two categories of numbers will be useful throughout their lives for many, many reasons. What are some ways to help children to memorize odd and even numbers? Paula Beardell Krieg has designed the most captivating number line in the world. The transformation can be done by a child or an adult. 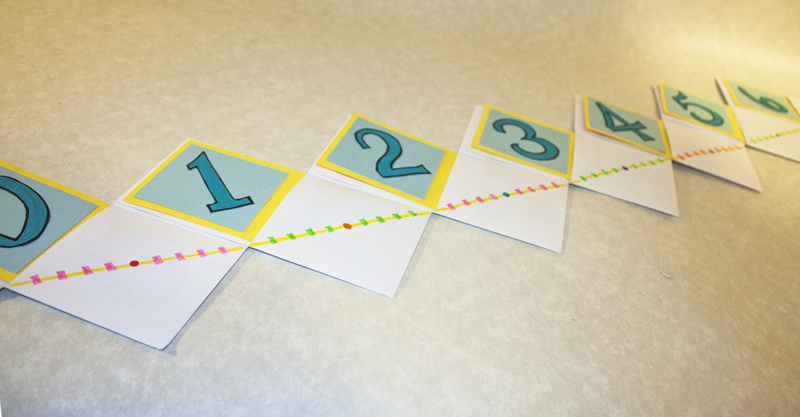 This number line that is made with envelopes is pretty enough to hang on a classroom wall, but it can fold up like a book, or be played with and changed so that real learning can take place. Paula Beardell Krieg shows several uses of it in her post, the-flux-capacity-of-an-artful-number-line, and promises to give directions on how to make one soon! Try these rhymes: 0, 2, 4, 6, 8; Being EVEN is just great! 1, 3, 5, 7, 9; Being ODD is just fine! Smartfirstgraders.com has several activities and rhymes to help students memorize the odd and even numbers. Finally, if you clap when you say ODD, you will clap one time. 1 is an odd number. If you clap when you say EVEN, you will clap two times, 2 is even. And as mathfour.com pointed out in more detail then I’m showing here: ODD has 3 letters, and 3 is odd. Also EVEN has 4 letters to help us remember that 4 is even.